A curtsy to those that blog regularly, I respect you sincerely. Often times I feel like I am cheating all the bloggers that update regularly. No one wants to have a relationship with anyone who only "takes" and "receives" yet never gives anything in return. I have been blogging for a few years now, and yet I can still get through my entire site in a few minutes. Now don't get mistaken, I am not trying to be like anyone else, I know that everyone is on their own schedule and pace for blogging. However, in my personal case, I have all the wonderful ideas and projects to share, yet when I sit down to share, I go on a blogging adventure, never to return to my initial objective, that of posting my days blog. I like this pose....my modeling is getting much better. It takes work blogging, but it is so satisfying, sharing with others that sew and design their own clothing. Posing for photos comes especially hard for me, since I am basically deep down an athletic type of girl. But, it is fun....so enjoy. This dress was finished last year for a Craftsy fitting class I completed with Joi Mahon. I had good intentions of sharing all that I had learned. However, because this dress was made for an upcoming vacation to Antigua, I was in such a hurry, that I never got a chance to really get good pictures. It was really important I share this particular project with you mainly because of all the extensive work that when into the fitting. 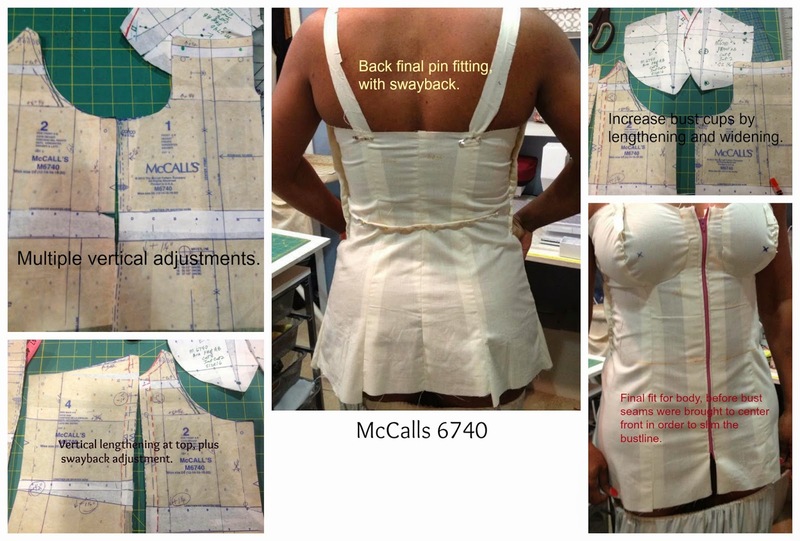 I used McCalls 6740, a fitted princess seamed bra-cup button front dress with godets a hi-lo shaped hem and thin straps. The godets were shaped, so it was important to arrange them in the correct order for insertion since the front and sides were of different lengths because of the shaping. After all the fitting and such was completed the dress went together really easily. The fitting work was well worth it since I plan to use the bodice half as a halter top in later iterations of this pattern. Otherwise, I would not have bothered due to all the lengthening and re-positioning of the bust seam lines that run through the cups. I literally had to redraft the pattern for the cups and reshape it so the "points" would go to the front of the dress and not "out" to the sides. Its almost embarrassing to share on a public format like this, but I have to remember, it not for so many trailblazers before me, paving the way for "share & share alike" blogs, I wouldn't learn so many great techniques myself. Yes, that is a little skin showing....just says, I had a little too much fun with the photo shoot. I hope you all enjoyed as much as I enjoyed sharing with you. I'm so glad you shared this beautiful dress. You take very good pictures and should be proud to pose for your audience. Your work on this dress is wonderfully done! Thanks Dorothy, I have so much to share. The only thing holding me back has been lack of good pictures. Keep a look out. There is more to come. I love it. I LOVE IT!!!!! I passed on this pattern when it was released because...DD's...lol! I think you have a fantastically perfect fit! And it's sewn beautifully! Normally I wouldn't put so much effort into a summer dress. Had it not been for the craftsy class and this dress being a great corset foundation I would have passed also. Work it, Girl!!! What an outstanding job on the fit. Can't wait to see the next version! Thanks Roz...I'm motivated now that another vacation to antigua is in the works. You look fantastic! Great job on the construction and fit. You wear it well. Cennetta, you have always been my inspiration for the perfect fit. I love that dress--the fabric, color, style, everything! A shrug or higher neckline would make it 'churchable'. My teenage daughter likes it--now that's saying something! Thanks Robin....!! Now that says a lot when the teens love your outfit... Tell her thanks.